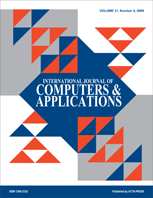 First published in 1979, the International Journal of Computers and Applications explores cutting-edge developments in computer science and engineering. All aspects of computers and their applications are covered, including cyber and network security, parallel and distributed computing systems, data mining, image processing, wireless and mobile networking and communications, game design, multimedia systems, language processing, and human-computer interaction. It appears quarterly.